Demolition lasted almost exactly one week and caused quite some tears in Mechelen, judging by reactions. The most historical part of AFAS Stadion is gone, now time to build for the future. It wasn't only an important structure locally, even in European scale the main stand in Mechelen was worth noting. Built back in 1952, it was one of the first grandstands with concrete cantilevered roof that left no obstructed views. Renovated on numerous occasions, it recently hosted only around half of its initial capacity of 3,500 people. Now all of that is in the past because on April 13 demolition had begun. On Friday the very last standing piece collapsed, marking the end of a week-long demolition. After the rubble is removed, construction of its successor can begin. In terms of capacity not much will change. There will be roughly 2,000 regular seats. However, on top of the regular seating two strips of boxes with additional 800 will be added. Some three levels of floor space for hospitality also means a massive increase in revenue from matchday and non-matchday commercial activities. The new grandstand should be ready in 2019. 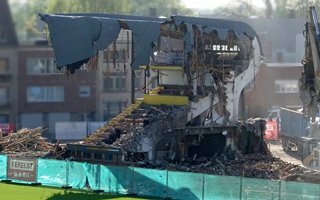 Photos from the old one's demolition are published in one gallery from last week in the construction section of StadiumDB. Here we only present the final outcome from Friday. All photos come curtesy of passionate photographer Paul Martin.